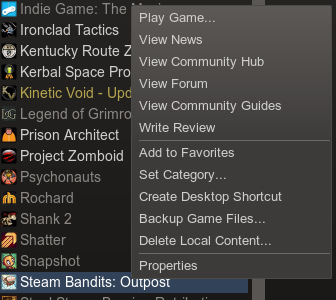 I've purchased Steam Bandits on Steam, but I'm not getting the "View CD Key" option in the steam right click menu. I've restarted Steam, I've tried the Verify Integrity of Game Cache procedure from https://support.steampowered.com/kb_article.php?ref=4950-EKAM-2644, and I've tried reinstalling the game, but it's still missing. Could i ask if you are using steam on a Mac? Alright, we spoke to steam about this problem since basically non windows users were all having this problem. They told us that they found the error on their side and a restart of steam ought to let you see the CD key now, please do let us know if you still cannot get it. I was having this problem too, fixed now with a steam restart. Yep, I can get the CD key now. Fantastic, glad it's worked out for everyone having the problem, happy playing! Im still having this problem, and im on a windows machine. But since the game is in early acces, steam dont have a support option for it. Just to let you know, its now 2 months later and the problem persits. When are you out of beta as i really like to start playing soon. Hmm, that's realllly strange. When you right click on the game in your library and select Properties, what do you see in the DLC tab? The bottom part is from my steam user account. That's so weird! My only guess is Valve messed up somewhere. I'll send you a PM on our forums to help get you on your feet.